Free; limited to the first 60 kids Chaperone Required: Adults must stay with their children; no drop offs. Girlstart’s Discovery Green STEM Saturday initiative includes fun hands-on STEM activities that foster general awareness about STEM and encourage children and families to recognize that ‘STEM is everywhere.’ More information about STEM Saturdays at Discovery Green can be found at: http://www.discoverygreen.com/1360712 Paper Circuits Create your very own greeting card with a special twist - lights! Explore new concepts such as conductors and insulators, complete and incomplete circuits, and energy transfer to make a light up card to brighten someone's day. 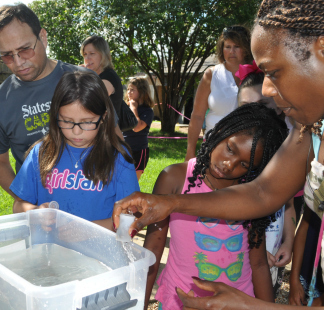 Continue reading "Discovery Green STEM Saturday"